Ideally suited to two people, or perhaps throw in a couple of kids, the Ranger XTC Campomatic offers everything one could wish for while hitting either dirt roads or the most difficult, remote tracks of Australia. Lock-up storage boxes galore allow plenty of easily-accessible gear to be stored on the drawbar and within the rear drop-down hatch. All doors have pinch-weld automotive-style rubber seals to ensure rain and dust stays out and every door also features multiple locks to ensure the lid actually seals evenly – four on the largest drawbar mounted box and they are all lockable providing excellent security. For those keen fisho’s, the side opening boat loader features six gas struts to ensure ease of use and allows the boat to lay flat on the ground beside the camper without having to untie a single knot to remove it. The outboard motor (up to 15hp) is safely and securely carried within a dedicated storage box with a 100kg rated slide out drawer. The design of the loader also allows extra gear to be carried under the boat – a great spot that generally goes unused. 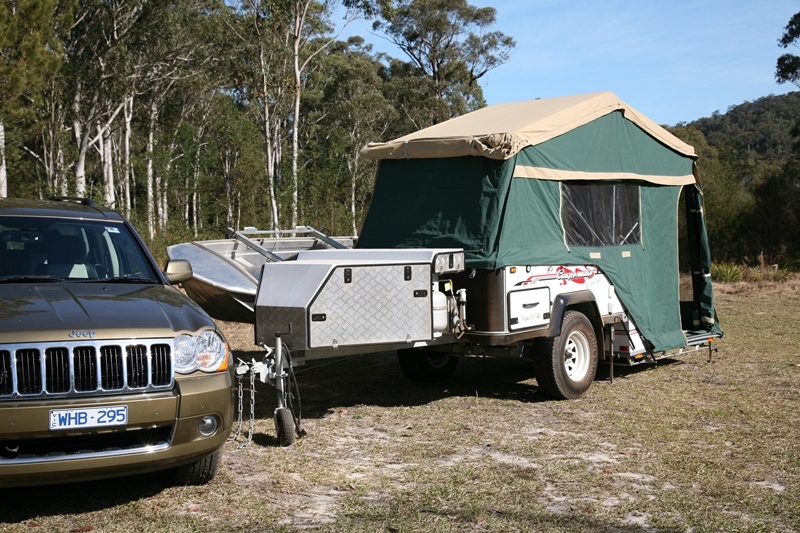 An optional folding boat trailer also fits under here, which is ideal if you've set up camp and want to launch your tinnie from its own dedicated trailer. If you're not taking the boat away, the loader still allows for plenty of extra storage in something akin to a roof top storage bag – just remember to pack it securely as it’ll get flipped upside down when opening the loader! A 9kg LPG bottle, space for two Jerry cans, a hand water pump and a built-in, upright eutectic Waeco 65L fridge freezer round out the gear mounted in and around the chequer plate-lined aluminium-skinned wedge-shaped front box, which is shaped to deflect stones away from the trailer and not back at the tow vehicle. This wedge shape helps negate the need for a dedicated stone guard and allows the tow vehicle to jack knife without touching the box – great for reversing into tricky camp sites! The compartments within the wedge box can be customised to your requirements; meaning your choice of fridge, generator or whatever other gear you’d like to cram in is all possible. A step rearward on the passenger side sees a full width, slide-out compartment that houses an impressive stainless steel kitchen, complete with four burners, grill, sink, washboard, storage and a large fold-out table that is ideal for food preparation and is all easily cleaned. Fold-down, individually adjustable legs, assure a steady foundation for the whole kitchen and allows cookie to do their thing with safety at meal times. There’s even a 12 volt, pressure switched cold water tap to make transition from home to campsite all too easy. Accessing the fridge or knocking up a culinary delight can be done trackside, without setting up the canvas, or under the zip-on side awning when the whole shebang is erected. can be recharged in four ways – solar, 240 volt battery charger, generator and by your vehicles alternator when driving. All wiring for all charge methods is included. Being a hard floor camper, there are adjustable height legs on the rack, which becomes the floor – this allows for set up on uneven ground without the canvas walls being either saggy or too tight. Campomatic utilise their own engineered design of independent trailing arm suspension, complete with coil springs, shock absorbers and restraining straps. The design appears extremely well built with cross-trailer and for/aft bracing to ensure the suspension system doesn't twist the frame or allow the axles to become miss-aligned during suspension cycling. Each axle/wheel can be aligned separately to ensure true running and even tyre wear and feature 10 inch electric brake drums. The dedicated and integrated off road chassis is fully galvanised and sees the draw bar extended to become the chassis and run right through to the rear of the trailer. All chassis bends are laminated with a second skin, ensuring strength and durability. Another clever use of generally wasted space is within the rear chassis cross member; it has a lockable opening to store all the tent poles – clever indeed! A 120 litre water tank is located to the rear of the axle (somewhat helping to even up the drawbar weight), as are two drop-down stabiliser legs. The stainless steel, swing away spare wheel carrier is a work of art and utilises a locking mechanism more akin to the trucking world. Once unlocked, the carrier locks into the open position so as not to allow accidental closures while at camp. Up front a poly block hitch takes care of most off road angles and the braking system is electric with mechanical over ride as a backup. A handbrake ensures your Campomatic doesn’t wheel itself away unintended. Rims are steel 16 inch, while tyres are off road orientated 265/75R16 – same goes for the rear mounted spare. The canvas is a high quality Australia made 12 ounce material, with large side and front zip-on awnings as standard and annex walls as an option. Setting up the tent is an easy affair, thanks to the multiple gas struts that push and pull everything into position. Once the boat loader is deployed to one side, the hard floor and canvas almost automatically set themselves up – hence the aptly named Campo-matic! Packing up is just as effortless, which makes this setup a great investment for either a retired couple or our female partners to easily get involved in making camp, instead of needing the blokes to man handle heavy and awkward alternate systems. From our short use of the Campomatic, it appears to be extremely well designed and manufactured, offers excellent two-up luxury camping and utilises all top-notch materials. It’s a camp trailer that exceeds most ‘tent-on-wheels’ offerings and certainly will look the part behind any 4WD on any track – especially when it’s got a covering of our brilliant outback red dirt…sprinkled with some black mud, white clay and home is a distant memory ‘caused you've become accustomed to travelling in style-o-matic!